Known for providing drivers with reliable and dependable performance, a properly maintained vintage Mercedes Benz turns heads out on the road even more than a brand new model. Timeless, simple designs help showcase the comforts, power and performance capabilities that Mercedes has provided drivers for over 90 years. Helping you properly maintain your Mercedes are the experts at German Motors & Imports in San Diego, CA. 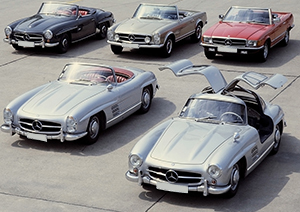 For almost 60 years we have been the area’s premiere service center for classic Mercedes services and repairs. Since 1959 German Motors & Imports has helped drivers preserve their beloved car’s performance and appearance with quality services and honest customer service. Call us today to start your next project or to schedule repairs/services for your classic Mercedes with our mechanics.